The first of it's kind in Sevier County bringing Big City Style to our small and growing town by offering the latest trends in hair coloring, cutting and styling. The salon offers everything from Beautiful Bride to Rockabilly, with killer make-up services as well. 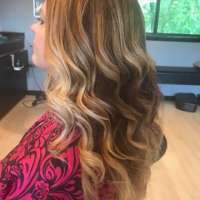 Fringe salon specializes in the latest trends in hair styles, hair color, makeup, pedicures and manicures with a specialty in updos for weddings, proms, homecomings and other special or formal events. Founded by stylist that have attended the Matrix Global Academy in New York and the L'Oreal Up Do courses. Our Stylist have an excellent grasp of styling for all ages. Our stylist's will also be attending classes later this year in our ongoing effort to keep on the cutting edge of trends in hairstyles and makeup. Every experience with us begins with an in-depth consultation, enabling our skilled and experienced stylist to fully customize and design the right NEW for you. Specializing in Wedding and Formal Updo's in the Pigeon Forge, Gatlinburg, Townsend and Sevierville area.